brach 3 months, 2 weeks ago. I just completed the build of a Quaverato. It seems to be working properly. I have however noticed a dramatic difference when the Quaverato has a buffer (or engaged pedal) before it, as compared to guitar straight into Quaverato. The buffer or engaged pedal into the Quaverato results in a significantly brighter tone and more volume than without. When the Quaverato is engaged without a buffer, it significantly darkens the tone, compared to the bypass signal. It is not really a problem, and I have experienced the same type of effect in other LFO modulation pedals. But I want to know if this normal for the Quaverato, or is there an issue here. Thank for the post Mark. Yes, what you’ve discovered is expected for the Quaverato. This happens because the high frequency signals have much less impedance going through the pedal input and U2A (the first opamp stage) than the low frequencies. You should be able to adjust the HPF and LFP trim pots (while testing it inline with a buffer pedal) to make it sound more natural. If you want to go deeper, a mod you can do to reduce this effect a buffer has on the brightness of the pedal is to add a capacitor in parallel to R3, which will allow the high frequencies to pass around U2A without being amplified/buffered. That may be more information that you wanted to hear, but hopefully that answers your question. Thanks for the reply. I am glad to know it is working as expected. I always have some buffered pedal upstream, and I prefer the brighter sound. The pedal sounds great. I especially enjoy the harmonic mix feature. The assembly instructions and board layout are excellent. And the build experience was very enjoyable. It’s great to hear that you are enjoying your Quaverato. Let me know if you have any more questions. I am having the same characteristics with my pedal. My problem is that sometimes I want the pedal by itself with the guitar direct, and sometimes I want it in a pedal chain or effects loop, both of which make it sound tinny. I will try the capacitor bypass you suggested above. What value would you recommend to make the pedal as agnostic to input source as possible, so I can dial in the tone once. Upon exampaning the Quavearto circuit I think what would help this issue of being so bright when a buffer is plugged into the pedal is a resistor between pin 1 on U2 and the high pass and low pass RC filters. Attached is a picture of the PCB which indicated how to make this mod. 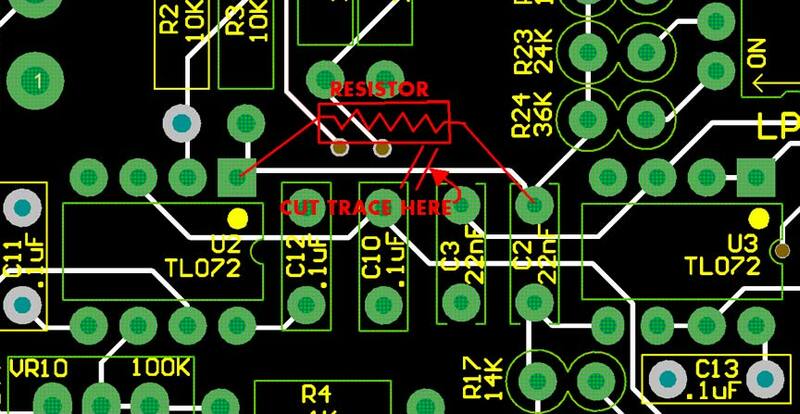 You’ll have to use your xacto knife to cut a trace and then add a resistor between pin 1 of U2 and C2. A starting point for the resistor value should be between 1k and 10k. The larger the resistor the more immunity it should provide for the brightness effect. Please note that I haven’t had time to try this yet so this is only in theory. But if you do try it, please let me know how it works for you. The capacitor mod I mentioned could have a starting value of 1nF….which corresponds to a LPF cutoff of around 16KHz. The value of C (in farads) is equal to 1/(2*pi*R*f), where R is the value of R2 (10K) and f is the low pass cutoff frequency you want. You can recalculate for whatever LPF cutoff you want.